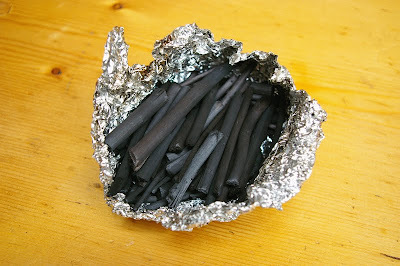 Last weekend, I started making some new charcoal. The first batch that I had produced earlier in the year made for an excellent drawing charcoal, but failed as a paint pigment. I'm working on refining the process, so that it can be used for both. The trick is to bake the wood just right minus oxygen, so that it is mainly reduced to pure carbon. The wood should be allowed to breathe just a little, because it will outgas as it bakes. Allow too much air and it will be reduced to ash. 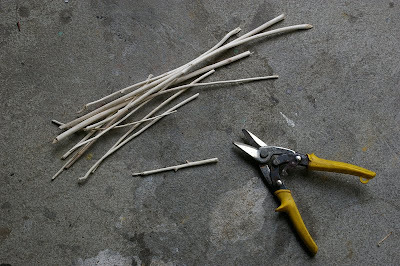 I gathered up willow branches, allowing them to dry several weeks in advance. They were stripped of all of their bark. Using the trimmers, I cut them into many small pieces. I'm considering building some kind of retort to burn the wood in the future, but for the time being, I'm relying on the same methods I used for my first experiments. 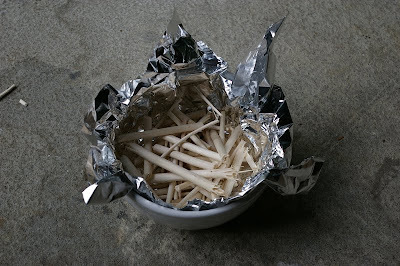 The willow sticks were stuffed into a stoneware bowl lined with foil, wrapped again with foil, and the top of the bowl was covered. It was placed in the hot wood oven. The charcoal fresh out of the oven. I would guess it is about 80 percent charcoal at this point.